It's Birds is a multi-channel sound installation that takes the sonic sensibilities from Watkins's 2017 music release Respite and both deconstructs and expands its elements into a site specific piece. It utilizes synthesized sounds and heavily processed stringed instruments to maintain a meditative auditory experience while providing it's listeners a different experience depending on their relation to the speakers, and embraces the randomization of un-synchronized audio loops to create an experience that doesn't repeat the same way twice throughout its duration. Lastly it's also a lighthearted sonic jab at the terrifying bird sounds being amplified at the nearby John Marshall Courts Building. It asks: if it's possible to amplify actual bird sounds and cause repulsion, is it possible to amplify synthesized bird sounds and cause bliss? The new Dumb Waiter is out now! tracked at Gallery5 and mixed at my new studio space in Scott's Addition, we then handed this jammer off to Colin Marston for mastering. It's totally bonkers. give it a listen. Respite is a single 21 minute long experiment in field recording, dulcitar and digital sound manipulation, different from things I've done in the past and different from things that I'm working on for my next eventual proper full-length record, but still very much anchored in the sonic territory I often traverse, But in a more minimal, abstract and ambient fashion. The field recordings were captured in April 2017 in PA, and everything else was recorded and mixed in August 2017 in Richmond, Virginia. It should be equally well suited for critical listening on a quality set of speakers or headphones, or on faintly in the background. Regardless, thanks for your support and thanks for listening. The audio is one semi-improvised take all the way through, and the film crew outdid themselves with a boatload of cameras capturing all sorts of shots that document the old GRTC Bus depot street art installation as it stood before it was handed over to developers. Got more recording projects for others coming up and I'll also be laying the groundwork for my next solo record. As I update the site, I'll be making room for some more of the instrument building I've been doing as well as some other various art projects. Stay tuned, lot's of exciting things going on. Thanks for listening. 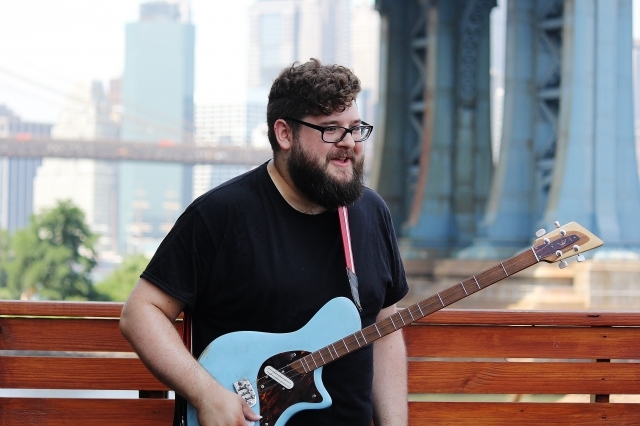 Really stoked to share this live performance recording from my tour through New York this past summer. 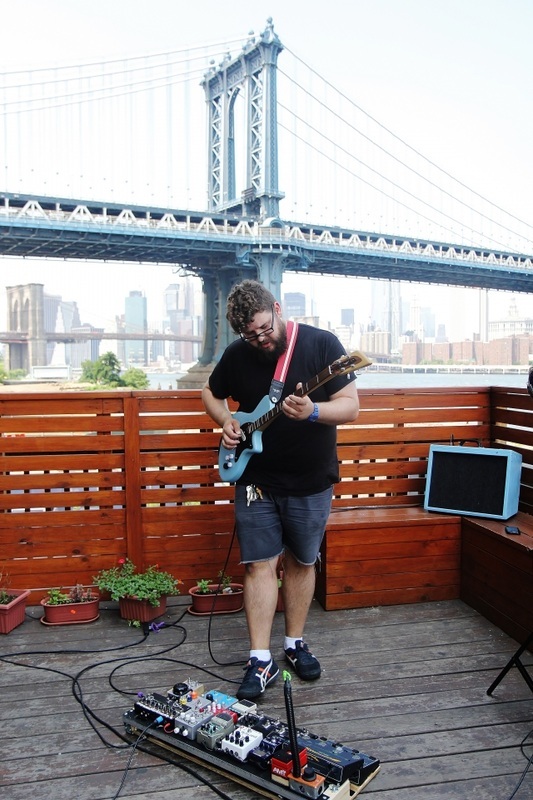 Nothing quite like performing on a deck in Brooklyn with the Manhattan skyline in the background. Massive thanks to everyone at CHARGED.fm, ATYPICAL BEASTS and SIXPOINT BREWERY for making it happen. Enjoy! A couple weeks ago I got the opportunity to head up to New York City and play shows in both Brooklyn and Manhattan. It was extra rad because I got to hang out and play with my good friends in Night Idea, Dumb Waiter, Navi, and New Turks. So yeah it was definitely RVA taking over NYC. 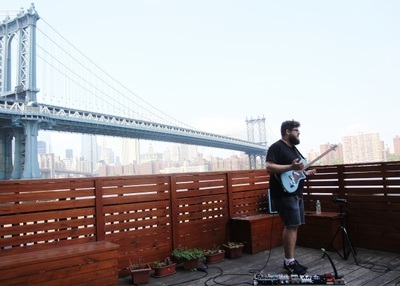 On top of all that I got to do a live filming session at the CHARGED.fm studios, It was nice enough out that we were able to do the session on the deck with the skyline and bridges in the background. Check out these photos! For more details on the session check out the write up here. 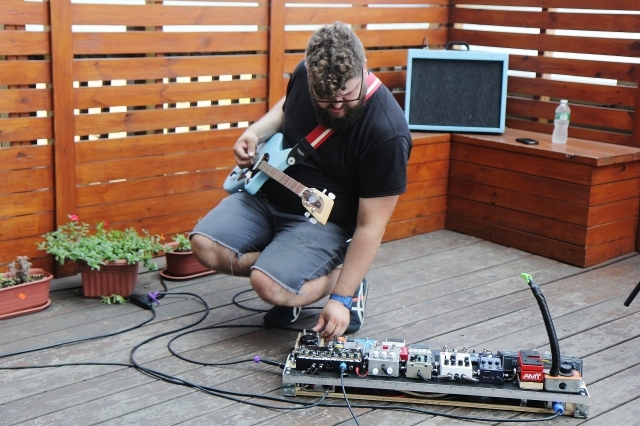 huge thanks to CHARGED.fm, Atypical Beasts, and Sixpoint Brewery for having me. LIVE FROM THE CAVE is now stream-able via youtube and download-able via bandcamp! and don't forget to head on over to my fabebook music page and say hello! as always thanks for listening... and watching. NEXT TUESDAY! 7/8/14. I will be releasing a set of live audio + video recordings that highlight my current live rig and sound reactive glitched out projection work. These will be releases in both video format on facebook , youtube, and vimeo and the audio will be released as a stand alone free download through my bandcamp page. Get stoked. spread the word. And while you are at it I now have an official facebook fan page. Please like it, share it spread the word. Thanks for the support and thanks for listening. Yesterday I played a solo set out in Winchester at Willow Grove that was part of a brand new music festival that we will hopefully see grow and happen again for many years to come. The setting was gorgeous with a picturesque lake and willow trees as the backdrop to the stages, and the weather was just about as lovely as anyone could hope for on a summer's day in Virginia. I got to see a lot of great RVA friends perform as well as some different bands from elsewhere around Virginia whom I hadn't seen live before. All in all it was great day out of town. My set was one of the last of the day, after sunset, and myself along with two other more experimental acts performed within the confines of an old stone barn foundation. It was pretty magical and for me it was nice as it had the intimacy of playing a house show or small venue... while still being outside and having the stars and clouds visible overhead. As is often the case when I perform, I really let the surroundings inform the music, so between the stone and the dirt and all the new faces it made for a pretty epic set. Huge thanks to all the festival organizers, all the bands and everyone who came out for making it it such a wonderful day! So last year I recorded the album Is This Chocolate? for my good friends Dumb Waiter. This year, they got together with some other friends and made this video. I can't take any credit for it, but oh my goodness it's ridiculously brilliant, so i figured I'd pass the word on. Enjoy!